I made $20k blogging this month. This is a record for me, so I thought it would be a good time to reflect and share how I’m making money blogging and specifically the steps I took to become a full time blogger from a high level view. My first year blogging, I made $8k. My second year blogging, I made $30k. My third year blogging, I made 45k. You can read the full story in How I Made $45K Blogging In One Year While Working Full Time. Each of these first three years, I was working full time. First, I was a lawyer, then I was a financial planner. When I started my fourth year, I was making more money than ever before, but it still wasn’t enough to replace my full time job income financial planning, especially still having student loan debt (although it was decreasing steadily). But I took a leap of faith anyways. I quit my second career and became a full time blogger or as I like to call it an online entrepreneur (this is what I identify most with right now after putting way too much thought into what to call myself!). This year (year 4 of blogging), I’ve made $85k+ blogging in 7 months (4 of which I was working full time). I will have doubled my income from last year in 8 months of this year. I’ve paid off over $135k+ in student loan debt, and I’ve built a six figure business, with goals to hit seven figures in the next couple years. My student loan debt will soon be a thing of the past. The best part is that I designed my dream life in the process. I have a business that is my new career that I couldn’t be more jazzed about. The whole reason why I started my blog was because of my student loan debt. I was soooo confused how I could have done everything right (based on what I was told and taught) and be in $206k of student loan debt and know not a damn thing about money. So, not even reading blogs, I decided to start one. That was year one. I knew nothing. I learned everything myself. I invested in courses. I made mistakes. But no matter what I’ve kept going. I share this because I want you to know I’m not a unicorn. I know this is possible for anyone who is willing to do the work. From coaching and teaching people over the last year, I know that many people just won’t do the work (something I seriously can’t relate to), but if you are someone who will do the work – and I mean really do the work – you can become a full time blogger. If you want to start a blog and become a full time blogger, you can follow the steps below. Side note! 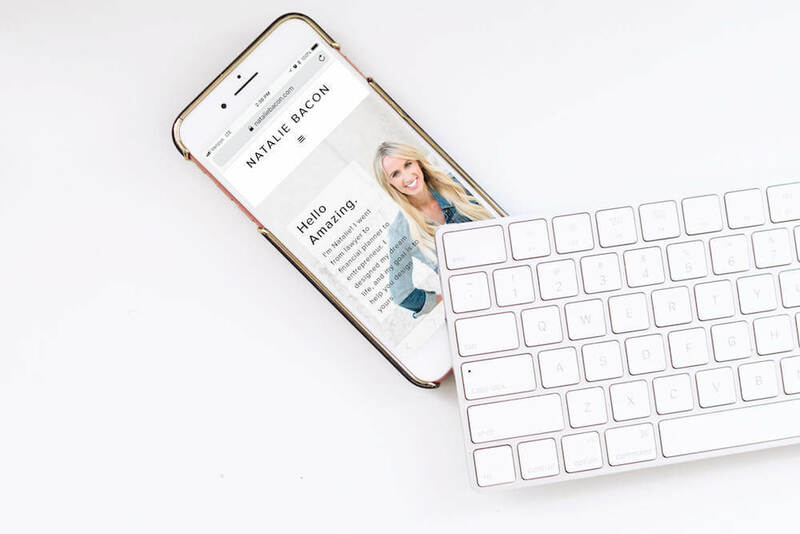 Before you get started, join the Free Online Business Training and get step by step lessons via email on how to start, grow, and monetize your blog! The first step is all about what you need to do before you actually start your blog. This step is really important, so don’t skip it. It’s the foundation you’ll build from, so you need to make sure you do everything in it for smooth sailing later. First, you need to decide what to blog about. There are so many things you can blog about, but I like to break it down to the most popular markets. After all, you are about to start a business that you want to become your full time job, so it’s best you enter into a hot market. The key is to choose something to blog about that you are both passionate about and that there’s a strong market for. You need passion because it will keep you going during the hard times. You need a hot market because you need to make money. If no one buys what you’re selling, you won’t be able to make money and become a full time blogger. Next, decide who you want to serve. More than anything, knowing exactly who your target market is will directly relate to whether you make money blogging. Identify who want to serve. Your blog is a business. Who are your target customers or clients? Choose a market that is willing to pay for the product or service you’re thinking about offering. Selling to broke people is hard. Choose a market that’s similar to you because you’ll be able to identify with the people in it (this isn’t a requirement but makes it easier). Choose a market you have experience with serving because it will be easier for you to identify with the market and become an expert at serving it. You should be able to identify exactly who your target avatar is. What does the person really care about? What do they think about? What do they search for online? What blogs and websites to they visit? Where do they hang out on social media? This is infinitely more important than what you name your blog, yet most new bloggers spend weeks on a blog name and barely can identify who they’re serving. As I mentioned above, naming your blog isn’t terribly important for monetizing your blog. I go through exactly how to name your blog in my free 5 Day Blogging Bootcamp Training. Next up in Step 1 is setting goals. There are many goals you should consider setting if you want to learn how to become a full time blogger and actually do it. Your end-goal is for your blog (e.g. : making money as a profitable business, helping people, having a hobby blog, becoming an influencer, etc.). If you don’t have an end-goal, you’ll wonder aimlessly. Your first year income goal. Your second and third year income goals. When you want to quit your job (timeline, such as 12 months). How much money you want to be earning before quitting your job (such as $10,000 per month). How much money you want to have saved before quitting your job ($50,000). It’s really important you set goals for your blog so you can work backward from them. If you don’t, you’ll push forward with a lot more resistance, trying to make up things along the way, instead of following a much more straightforward and faster path. The last part of Step 1 is to create a blogging schedule. If you want to become a full time blogger, you have to create a plan to do it. This means creating a schedule where you consistently work on your blog as a business like you would if you were starting a part time job. Read my Time Management Tips For Bloggers post to get 3 sample schedules for blogging. Each is based on putting in different amounts of time and all can easily be customized based on your level of commitment. Then, download my Blog With A Full Time Job 12 Month Plan. This is a freebie that shows you how to plan your first month and the following months after that for the first year of blogging. Regardless of which schedule you choose, make sure you put the time slots on your calendar that you plan to blog and honor those commitments. In each time slot, put the task you plan to complete. Each task should be something that’s moving you toward your blogging goals. Once you’ve done the prep work for Step 1, you’re ready to move on to Step 2, which is where you’ll actually start your website and launch your blog. You can start your own blog for as little as $2.95 per month. Here’s my complete tutorial for How To Start A Blog. I also have a free 5 day training for how to start a blog that you can join to get started now. You’ll need to design your blog right away. There are many ways to design your blog. I go into the complete tutorials of how to design a blog like NatalieBacon.com in Blog With A Full Time Job, but you can easily do this yourself with the Divi Theme. Don’t get too hung up on designing your site. I suggest finding another person’s blog you like (or looking at mine) and using it as a framework for how you want to design your blog. Obviously, make it your own, but pay attention to things like the sidebar, footer, header, images, etc. I suggest not using a free theme to design your blog because it won’t be updated as frequently, which is a problem when there are WordPress updates to your blog. When your theme isn’t updated and you use WordPress, this can cause tech issues. With a paid theme, the engineers are going to be on top of updating the theme. You also go so much more capability with paid themes. It’s really important for your brand that the images reflect the message you’re trying to send to your target market. That said, don’t obsess over your images. You don’t have to use stock photos, but I think it’s the easiest way to make sure your blog looks good. If you have a blog about fashion, food, or something else where photography is super important, you’ll need to take your own photos. Use your best judgment. You can always change your images. I’ve changed mine 235348 times – approximately. You need to set up social media accounts for your blog. I don’t think you need to (nor should you) focus on growing all these platforms at once, but you should at least have accounts up and post on each platform so your readers can find you on their preferred platform. Once everything is all set up for your blog, you’re ready to create content. This can feel insanely scary and overwhelming in the beginning, but I promise you it gets easier with practice (like anything else!). The best thing for you to do is sit down and force yourself to write a few really bad blog posts in a given amount of time. Don’t aim for perfection. Don’t aim to solve all the problems in the world. Don’t aim high. Just aim to finish the blog posts. It gets easier. I swear! Always have your avatar in mind (that one person who you’re writing your blog to) and act like you’re writing her an email. Provide value, but also include story. There are so many cool tips out there for writing blog posts, and you should explore them down the road. But in the beginning your sole goal should just be to hit publish. Done is better than perfect. Always. You should post consistently (e.g. : every Monday at 5am) and frequently (at least once per week (preferably 2-3 times per week). It’s important your readers know when to come back to your blog. They have to be able to rely on you for new content. Here’s a good post with a list of 100 blog post ideas to get started writing. You shouldn’t write content because you want to. You should write content that you think is going to help your target reader solve a problem. This can be in the form of a how-to blog post, a resource guide, a list post, or something else where you provide value. You don’t need to be an expert. But you do need to focus on your reader and not on yourself. Weave in your story as it relates back to solving your readers’ problems. It took me fooooorever to understand this but once I did everything got easier. Example: my blog post How I Made $5k In 5 Days On My Blog is a story about me but really it’s a testimonial to how to make money blogging. See how that works? I’m helping my target audience learn how to blog but I’m doing it through the story and testimonial of my own experience. If you’re starting a blog with the intention of it becoming a business, you have to focus on your reader – not on you. So, always create content intentionally for helping your reader in some way. So, you have your website up and you’re writing blog posts. Now, it’s time to drive traffic to your blog. “If you build it they will come” is a lie. If you build a blog, they will not come. You have to direct people to your blog against all the internet forces working against you, lol. There are many ways to drive traffic to your blog. I spent a ton of time perfecting my Pinterest strategy when I first started blogging and the payoff was (is) huge. I get free traffic from Pinterest to the tune of over 100k pageviews per month to this day. You can’t get this type of free traffic as a new blogger anywhere as easily as Pinterest. This is why I always recommend it first. Pinterest Traffic Avalanche is the course I took and the strategy I implemented for getting so much free traffic from my blog. I highly recommend it. The second best option for free, organic traffic is YouTube. And the third best is from Google (this is actually the best way, but the hardest for new bloggers). Pinterest, YouTube, and Google are all search engines, which will give you much better, consistent traffic than the random traffic you’ll get from social media (Facebook, Twitter, or Instagram). There are other ways to drive traffic, like guest-posting and paying for traffic (usually with Facebook ads) that you should explore down the road (something I talk about in Blog With A Full Time Job, if you want more info). What this means is that the bigger and more engaged your email list, the more money you’ll make. To make a full time income from your blog, you need to build an engaged email list with people who are in your target market. Email is better than other online platform because you can directly access your subscribers, unlike social media where you are the whim of algorithms and Mark Zuckerberg. The best thing you can do for starting to build an engaged list right away is use the right email service. The reason this is so important is because you have to use a strategy for getting people on your email list and engaging with them through sending lots of emails. You won’t be able to do this effectively with the wrong platform. I started with Mailchimp and it was a mess for the first year and a half. Everything got better when I switched to ConvertKit because I could actually collect email addresses, put forms on my site, and send emails the way I wanted to. You can get 30 days free with ConvertKit with the special deal I have for my readers. Whatever you do, make sure you focus on building an engaged email list from the beginning! It’s not enough to build your email list and expect to make money from it. You have to know exactly how to monetize your list. The way to do that is by creating a monetization strategy. This step is the most important step in your ability to become a full time blogger. Yet, it’s the step most newbie bloggers wait too long to implement. I’ve also heard Frank Kern say you shouldn’t waste your time building a list until you have a sales process. The truth is, it’s hard to know which to do first – growing or monetizing. It’s the chicken and the egg problem. Really, you need both. So, I suggest getting momentum and growing your traffic and list a little bit first, then creating a strategy for making money. Your job as a new blogger wanting to blog full time job is to figure out 1) what you’re selling and 2) how you’re selling it. These are all the ways you can make money online as a blogger. I want to point out not all monetization strategies are equal. In fact, they’re all very different. It matters a lot how you monetize because as you grow, you’ll just scale what you’re already doing. So, you need to choose carefully. Starting with display ads is an easy way to make money. It’s completely based on traffic. There’s isn’t much strategy. The downside is you won’t make a ton of money this way as a new blogger. The upside is you’ll start to see a little cash roll in, which helps give you momentum. Next, I suggest implementing an affiliate marketing strategy. Affiliate marketing is where you sell other people’s products and are paid a percentage of the sale. For example, if you see a fashion blogger promo a dress, then you click on the dress and buy it, she’s paid a percent of the purchase price. Affiliate marketing costs you nothing (low risk) and is easy to scale (high reward). This is one of the best ways to start monetizing as a new blogger. It’s not as easy as throwing up links in blog posts and crossing your fingers someone buys, though. You have to have an affiliate marketing strategy. I’ve taken Making Sense Of Affiliate Marketing for this. It has everything you need to learn how to start making money with affiliate marketing. There are many other ways to become an affiliate for products, too. For example, if you take any one of my courses, you can become an affiliate for them and then sell them to your audience. Affiliate marketing is one of the best ways for a new blogger to monetize relatively quickly. After you’re making some money from ads and affiliate marketing (~ $1k-$3k per month), you’re ready to implement the next monetization phase, which is creating and selling your own digital products. Creating your own digital products is more of a risk than when you’re selling someone else’s products (as is the case with affiliate marketing) because you have to spend time and money creating something not knowing for 100% certainty if it will sell. That said, the reward is highest with your own products. Your income potential is unlimited, and it’s a lot easier to sell something you’ve created than to sell someone else’s product. Before I created my own products, I was making about $3k-$4k per month blogging. Then, I created my first products and almost instantly doubled my income. I became a six figure blogger, and I’ve never looked back. The best (and frankly only) way, in my opinion, to learn how to create your own digital products is by taking Six Figure Blogger. This is the course I took. I did everything in the course. And I became a six figure blogger. Here’s the video where the creator interviews me as their first successful student. There’s no reason you shouldn’t be a six figure blogger after following all these steps. *Add in any additional strategies only to supplement income (e.g. : freelance writing or virtual assistant work). The 3 strategies above are really all you need to scale a website into your full time gig. However, there are going to be times where you can’t do exactly what you know you should for one reason or another. When this happens, I suggest implementing other monetization methods to make money quickly to invest in your blog. Each one of these strategies lends itself toward making money quicker than with affiliate marketing or creating and selling your own products. Keep in mind the downside, though, is that they’re not scalable and you’re trading time for money. I used to freelance write to earn extra money for my blog. I couldn’t justify spending personal money on my blog, so I decided to pick up freelance writing as a side hustle. Whatever I made from writing, I invested in my blog. This worked great for a while, but once I really wanted to start scaling my blog income, I had to quit writing because I didn’t have enough time to invest in my blog, work full time, and make money writing. I think you have to have money to invest in your blog if you want it to become your job. You just can’t do it for free. So, however, you can make extra money quickly to put into your blog – you should. Just be careful that you don’t turn that into your overall business model unless that’s what you want to do. Once you make about $5k-$10k per month, you should be ready to implement more advanced strategies. You can also incorporate many strategies at this point to exponentially grow and scale your income. Notice that at the heart of this step by step guide for how to become a full time blogger is focusing on the result you want—to make money blogging. I intentionally don’t include a step to focus on growing social media just for the sake of growing your platform. The way to become a full time blogger as quickly as possible isn’t through brand marketing or influencer marketing, where you build a platform and try to get sponsorships. The fastest and most sustainable way to become a full time blogger is to use direct response marketing to serve your target customer through a legit business model (and for the record, this still doesn’t happen all that fast). Once you have a business as the foundation for your blog, building brand and influencer marketing on top of it is a great plan. But do it too soon and you will be stuck in a cycle of not making enough money, trying to get sponsorships, and ultimately struggling financially. Go girl! I’ve been reading your blog for a long time (fellow lawyer, here) and am thrilled to see you hit your stride this year. This post is exactly what I needed to hear today. I plan to officially launch a new blog by the end of month and there just so much stuff to get done before that. So thank you for sharing part of your story today. Also thanks for saying social media isn’t everything because I’ve decide to only focus on pinterest for a while and was feeling bad because how would people be able to connect with me with out social media. That’s such a good plan! Pinterest is the bomb for traffic for new bloggers. you are so good,i will do this,together go.